Keep your glass clean and well protected with this water repellent combo! 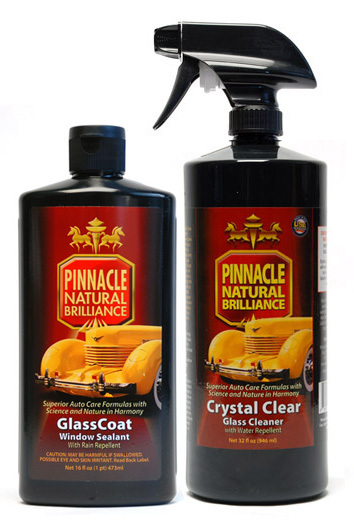 The Pinnacle Glass Twins combo cleans and protects your automobile's glass with extreme water repellency. Pinnacle GlassCoat Window Sealant with Rain Repellent and Pinnacle Crystal Clear Glass Cleaner with Water Repellent work together to keep your glass clean and protected. Water will bead into tiny droplets and run off the surface, improving your vision in inclement weather. The Pinnacle Glass Combo works together to keep your vision clear no matter the conditions so you can focus on the road ahead. Pinnacle GlassCoat Window Sealant with Rain Repellent is an advanced glass sealant that benefits you as well as your automobile's windows. It creates a hydrophobic film that sheets water away in tiny droplets. Pinnacle GlassCoat Window Sealant fills in microscopic pits, pores, and imperfections that reduce visibility. Pinnacle GlassCoat Window Sealant can last up to six months per application although monthly applications are recommended in wet climates. Clean glass thoroughly using Pinnacle Crystal Clear Glass Cleaner with Water Repellent first. If your glass does not feel smooth, polish using Pinnacle GlassWork Water Spot Remover. Add a small amount of Pinnacle GlassCoat Window Sealant with Rain Repellent to a microfiber or foam applicator and work thoroughly over a section of glass using an overlapping motion. Allow it to dry for 10 to 15 minutes then softly wipe off using a microfiber or terry cloth towel. Apply a second coat for best results. Maintain the water repellency and protection by frequently cleaning with Pinnacle Crystal Clear Glass Cleaner with Water Repellent. Spray Pinnacle Crystal Clear Glass Cleaner with Water Repellent liberally onto the glass. Spread with a glass cleaning microfiber towel such as Waffle Weave Microfiber Glass Towel. Turn to a clean side, or switch to a clean towel, and lightly buff to a streak-free shine. When cleaning interior glass, spray directly onto the towel. Heavy soil or excessive build up may require two applications. The glass cleaner is 32oz's of non streaking crud cutting power , it also helps the sealant adhere to the glass. With Glass Coat window sealant I applied 2 coats. I wanted to make sure the Sealant worked before I did this review, so I let it cure a day, then out into the rain. First it was beading then the faster I went the beads were flying off in every direction, just amazing ! I didn't need wipers, when I did use them I thought this will rub off the sealant but no, couldn't tell any difference just a clean window. By the way the rain turned into a torrental down pour & the Pinnacle Glass Twins handled every bit of it. This was a very good purchase, will be using it on all the cars of my loved ones to help keep them safer. Thanks Pinnacle. ProsA set that works together flawlessly. 32oz of very good glass cleaner & 16oz's of sealant. Used maybe 1oz of each Glass cleaner smells good. Amazing stuff. Really great quality product. Works as described. ConsPricey but worth every penny.